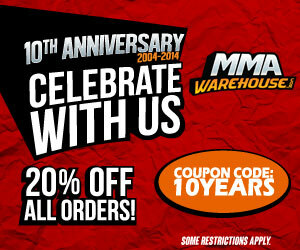 Best MMA gear, gloves, t-shirts, shorts and equipment reviews. Deathclutch is the official clothing of UFC Heavyweight Brock Lesnar. 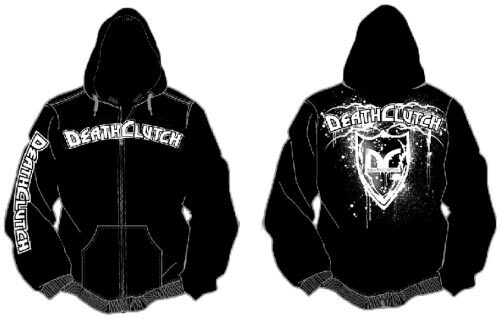 This Deathclutch hoodie entitled “”Guilded” features a new graphics and a zip up design. The front side and right sleeve displays the Deathclutch logo. It’s a simple design, different from the usual Deathclutch graphics with massive skulls. However, on the back has more character, no skulls but a shield and a splatter design. As most hoodies go, these are made with ultra-soft and think cotton for warmth and comfort. Just what Brock needs when training in the cold weather of Minnesota.